Louis William Gabus was born on May 6, 1847, in a family of a watchmaker Louis Gabus and his wife, Heloise Jeanneret Gris, in a place called Le Locle (Switzerland). Twenty-year old William moved to Russia and established the watch company in1868. In ten years William became a prosperous watch producer with a constantly growing income and owned a watch factory in Switzerland named «Berna Watch Co.», that produced watches and watch movements. At the end of the nineteenth century "Berna Watch Co." turned into an outstanding company, whose items were awarded gold medals at the international exhibitions in Chicago (1893) as well as in Paris and Milan (1900, 1906). From 1895 W. Gabus boutique and workshop for manufacturing and retailing watches and jewelry were located in Moscow, Russia on Nikolskaya St., 15 near the Red Square and Kremlin. The W. Gabus goods were renowned for their bright individuality, style and elegance. 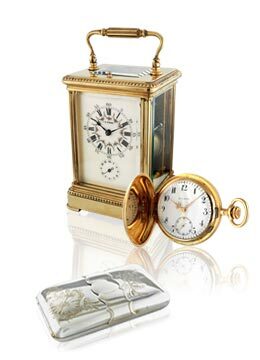 Contemporaries compared the W.Gabus watches to the Carl Faberge jewelry for their exquisite and perfect forms. In 1870 William Gabus married Hellen Plaut, citizen of Switzerland. The Plauts family was the family of merchants who established a lively trade in Moscow. Hellen's father, Francois Plaut, owned a large textile mill. Hellen's brother, Leon Plaut, was engaged in selling machines and mechanisms. Leon's wife, Sophie Plaut, ran a fashion glove shop on Kuznetsky Most St. On August 27, 1871, a son, Maurice Jean Francois, was born in the family of William and Hellen Gabus. By the early nineties of the XIX century W. Gabus owned significant real estate in Moscow and a area in Petrovsky Park with a villa called "Gabus". William Gabus's persistence and efficiency had resulted in success. His watch brand became the leading one in Russia competing with "Paul Buhre" and "Henry Moser". In June 1899, due to constantly worsening health , W.Gabus had to withdraw from business and leave Russia. W. Gabus bought an ancient castle Schloss Goumoens in Swiss city named Worb not far from Bern, and settled there with his new wife Julia Mattey D'Ore. That castle, one of the oldest in Switzerland, was founded by Duke Conrad II in 1143, half century before his grandson had founded the town of Bern. W. Gabus started restoring the castle and even built a stylized tower above the entrance gates, but failed to see the results of the restoration. On March 14, 1901 he died on the villa Muralto in Lokarno, where he had been receiving a treatment. W. Gabus left a vast sum of 150 thousand Swiss francs (today it's about 5 million) to town of Bern for the foundation of the Zoological Garden, which today bears his name. At the Zoo entrance the visitors can see a big boulder with Gabus's bas-relief and an inscription with grateful thanks to the generous donator. After W. Gabus's death Hellen Gabus successfully managed the watch and jewelry business. In 1908 the Russian Merchants Board included the "W.Gabus" firm to the list of first-rank Russian companies. The succesfull bussines was stopped within the first days of the revolution when the "W.Gabus" enterprise was nationalized. In 2000 the brand «W.Gabus» was reborn in Switzerland and Russia. The first watches bearing a name of its founder were produced in 2001. The prestigious gold watch collection was introduced in 2002-2003. In 2007-2008 W.Gabus Montres SA expanded the collection with the «Transmatic» line in three different variations. Currently, W.Gabus Montres SA plans are to extend the collection with the new watch models.